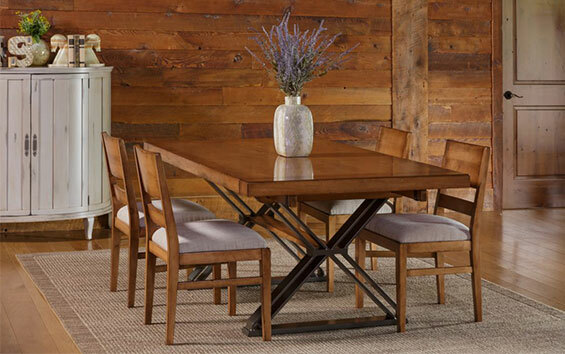 Every special event and every holiday spent as a family — your dining room table is a part of those special occasions. From spontaneous pizza nights, to helping your kids with homework, your table is at the center of those moments — and everything in between. When homeowners want a truly unique table, we help walk them through the steps of dining room table design. 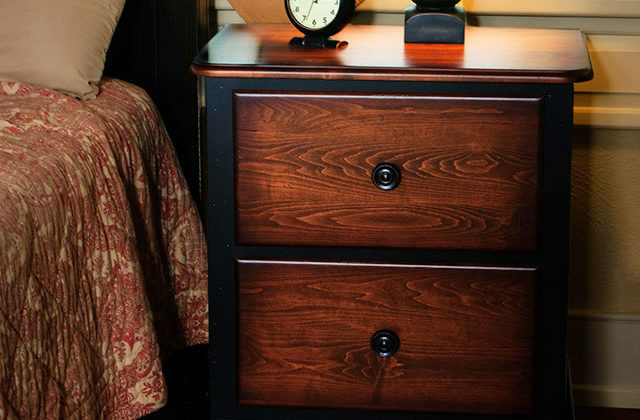 At Martin’s Furniture, we build custom heirloom-quality furniture meant to provide a lifetime of style and durability. 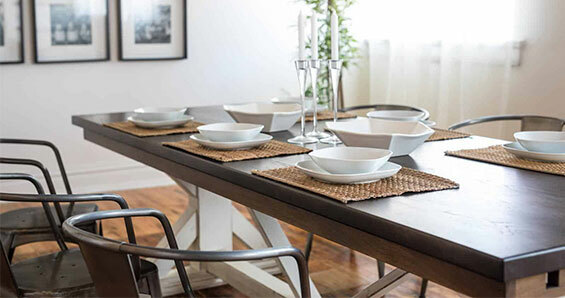 See how we walk homeowners through the dining room table design process — and start planning your custom built unique table today! What Type of Dining Room Do You Have? The right table needs to be right for the room in which it’ll reside. 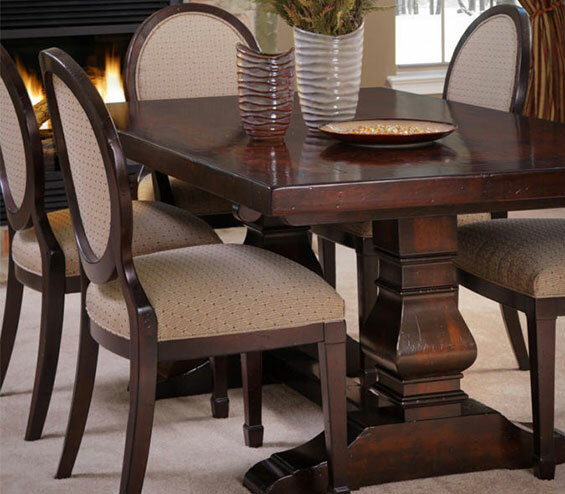 If you have a separate, formal dining room only used for special occasions, you’ll likely want a more ornate table. 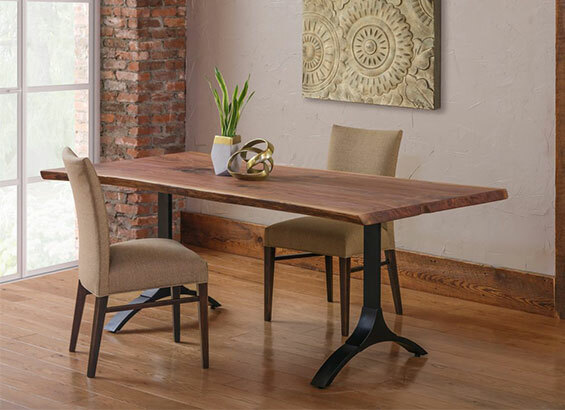 However, if your dining space and style are more casual, you’ll likely want a more modern, easy table to go with it. The next choice that needs to be made is whether you want your unique table to be a solid top or whether you’d like it to be extendable. Both options look equally good and are equally convenient. On most of our extension tables, the leaves can be stored inside or underneath the table to maintain its clean profile. Deciding on the size of your table is a matter of ensuring your design is big enough to accommodate all of your possible guests, but small enough to comfortably fit in the room. Our rule of thumb is that you need to provide 2 feet of space on the table top for each person who will sit at the table. When considering the room size as a whole, you’ll want to ensure that the table is 3 feet away from any of the walls or other furniture pieces such as sideboards. Modern, traditional or somewhere in between — you have tons of options for dining room table design. Once you know the practical specifics of your table, it’s time to select your style. This table fits into the modern aesthetic as it features an elegantly simple design, metal legs and a gorgeous living edge. On the other hand, the Queen Anne style table is decidedly traditional as highlighted by the ornamental table legs and oval-shaped table top. Both styles are fantastic — it all depends on what style speaks to you and your home’s decor. The next step in dining room table design surprises many people with whom we work. 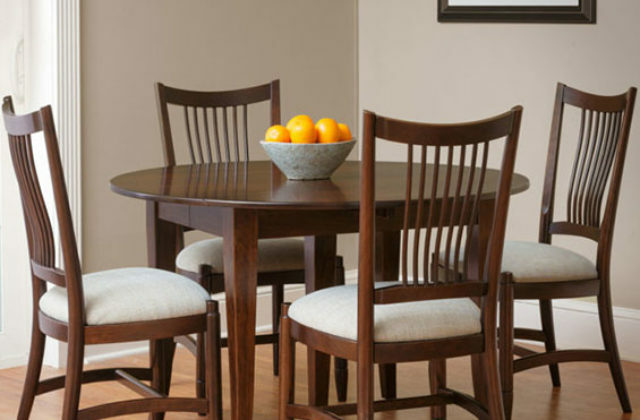 The table shape you select does matter and plays into the overall style you’re building. Rectangle tables are among the most common shapes for modern tables. The simple shape and clean lines play into the modern look. Boat shaped table tops and shapes with clipped corners are favorites for traditional, ornate style tables. 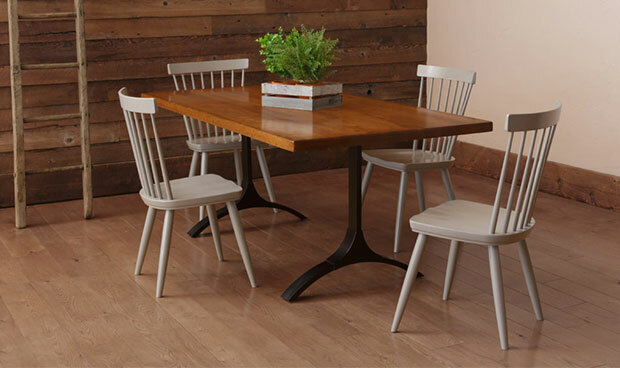 See all of our dining room table shapes. 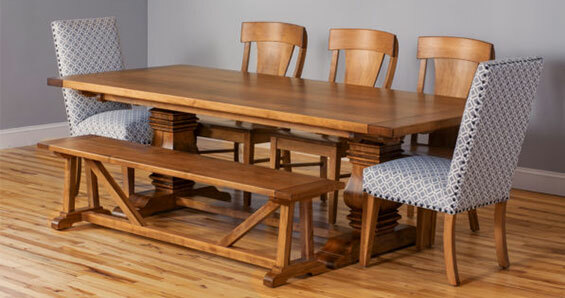 When designing a unique dining room table, you’ll be able to choose the species of wood used to build your heirloom table. Maple and Cherry are the most popular styles of wood on the market right now — and their popularity is well worth it. 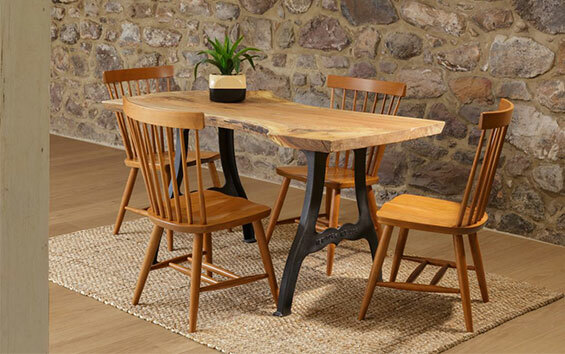 Maple is a very hard piece of lumber that resists denting and marring from every day use, which comes in handy when you plan to have the table for several decades. In addition, Maple wood is often hand-planed for a natural distressing look that is trending in modern design right now. On the other hand, un-distressed Cherry wood has a clean wood grain that matches well with the regal look of traditional style furniture. Learn more about the benefits of Cherry and Maple wood. One of the final touches in dining room table design, choosing a stain or finish allows you to further make your table your own. Some of our most popular stains include traditional light brown, modern gray, onyx, and unstained blonde for Maple wood. 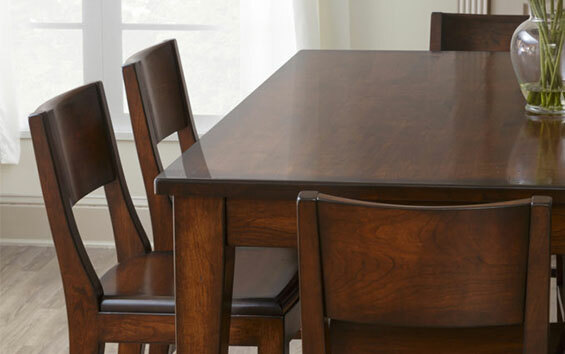 Homeowners often choose their unique table stain color by matching or complementing other wood in the dining room such as the flooring or the kitchen cabinets. These 7 steps are where our dining room table design always starts — and it can lead to some truly remarkable results. Whether you have a clear picture of the heirloom table you’re longing to spend Thanksgiving and Christmas around, or whether you’re still seeking inspiration, we can help. We recommend contacting us to learn more about ALL of your choices — as well as to discuss the budget for your unique table. Plus, if you’re in the Lancaster County area, you can always stop by our showroom to see and feel the handmade quality difference in person.